The City College Partnership in collaboration with the Division of Student Affairs is pleased to announce two new services available to all members of our community made possible thanks to the support of The Community Service Society. 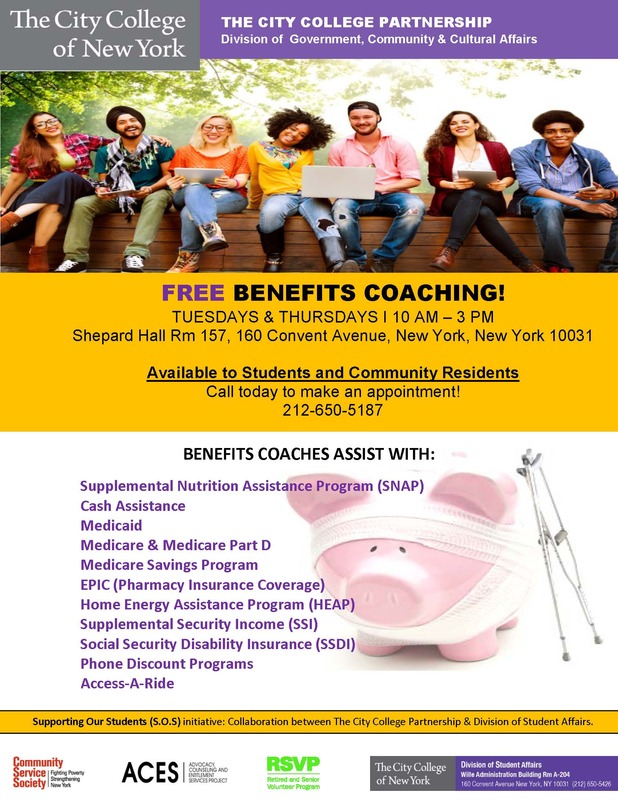 Benefits Coaching services are available on Tuesdays and Thursdays for individuals at risk of experiencing economic, housing and food insecurity and may be eligible to receive public resources for support . Free Financial Coaching services are provided on Thursdays to provide assistance with money management, debitcrisis, or building and repairing their credit, and more. For more information on The City College Partnerships' community support services or to make an appointment please call 212-650-5187. Call Lorretta or Teresa at 212-650-5187 to make an appointment. Starting June 2017, we will be providing assistance with access to no or low fee banking, credit building or repair, money management, dealing with debt, and other financial services. For free! Services will be available on Wednesdays. Please call (212) 650-7039 for an appointment.